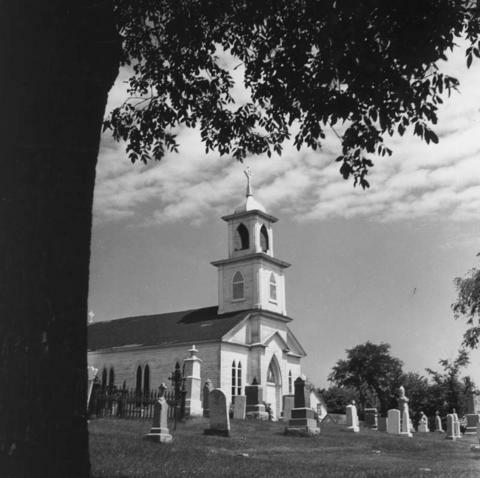 Photograph of a nineteenth century clapboard church with bell tower which was removed from its location (pictured) due to the rising waters of the St. Lawrence seaway. (Information from typewritten caption pasted on verso.) The area being submerged was one of the earliest settled in Upper Canada and a key battle site during the War of 1812. This church was preserved as part of Upper Canada Village (Morrisburg, Ontario), a restored historic village operated as a museum and recreation area. Handwritten in pencil on verso: Christ Church Moulinette CA Feb 58 HT 100 LINE. In blue pencil: Feb 58. Photographer's stamp on verso. Adamson, Anthony. "Crysler's Park." The Canadian Architect February 1958: 41-43.